Available in 17 countries from next week for €2,795, the Book One has been jointly developed by Porsche Design, Microsoft and Intel. Consisting of two ‘plates’ each 7.7mm slim, Book One features an autolatch, a seven-point trackpad, full-size keyboard with dimmable backlight, a 10-finger multi-touch touchscreen, and an Intel Core i7 processor. Its battery lasts ‘up to’ 14 hours, and it recharges in two hours. It includes an Intel Thunderbolt 3, runs on Windows Pro 10, and has Microsofts Cortana digital assistant built-in. Also in the box is a Book One stylus pen, USB Type C-to-HDMI adaptor, and a charger. Optional accessories include a docking station and a sleeve. 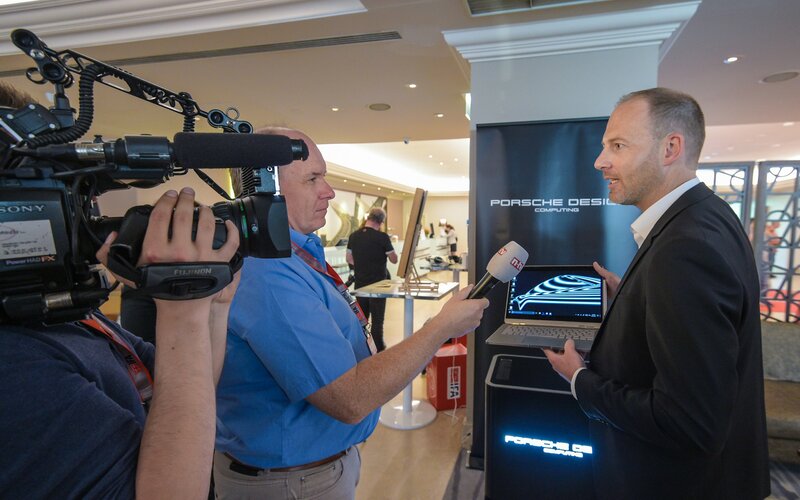 This isn’t the first time Porsche has branched-out from super-cars to embrace travel gadgets. Previous products have included the TecFlex pen and the P’9981 BlackBerry phone.